When I first moved back to my hometown after graduating from college, my mom and grandma invited me to help them have a garage sale. I had some stuff from my college days that I wouldn’t want or need when I moved into my new house later that year, so I eagerly said yes to helping them since it meant I could sell some of my things, too. Our turn out at the garage sale that year wasn’t spectacular, but by the time spring rolled around again the following year, I had more stuff to get rid of. So we decided to have another garage sale. This time, the sale was held at my house instead of my grandma’s house, and the turn out was much better. I think the location had quite a bit to do with it as my grandma’s house is at the end of a dead end street, whereas my house is right off of a busy intersection, and thus, easier to find. I never thought having a garage sale would become an annual event, but it seems that every year I have at least a few more things to get rid of, and when combined with my mom’s, my grandma’s, and sometimes my cousin’s stuff, we always have enough to have a garage sale. Another reason that it’s hard to give up having an annual garage sale is because I make so much money back from junk I no longer want or need. Our total “take” at the end of the garage sale each year is around $1,000! 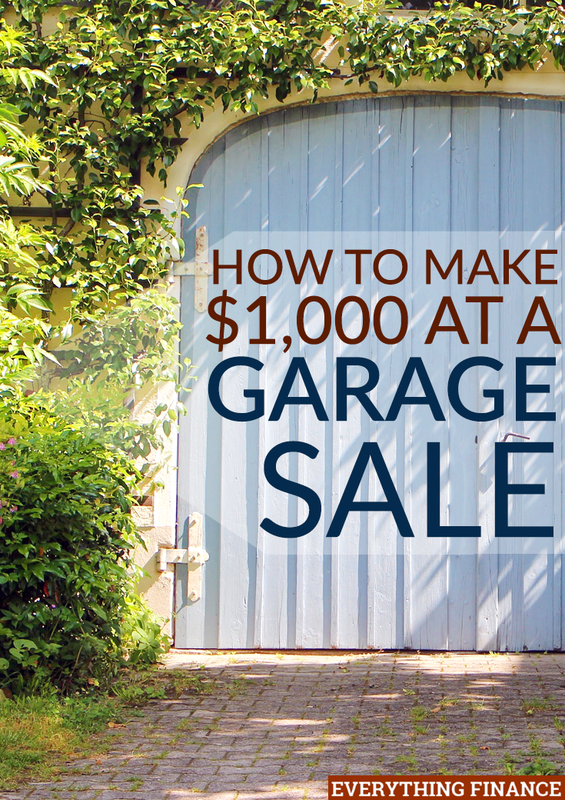 Here’s how we have a successful garage sale that yields $1,000 in one day every year, so you can hold your own successful garage sale! I’ve learned a few things about advertising over the past few years of having an annual garage sale. The first year location was not the only thing that contributed to a low turn out. We advertised the garage sale in the local paper, but didn’t put it anywhere else. Every year since then, we’ve advertised it in the local paper, at the radio station (for free), and online via websites like Craigslist and even our local Facebook Buy/Sell/Trade groups. I know these have had an impact on the number of people at our garage sale because I like to casually ask people where they heard about the sale when they come up to pay for their stuff. We’ve also caught more passersby by putting up signs at the busy intersection near my house with big, bold letters and an arrow pointing the way. I bought heavy duty plastic signs so I could re-use them each year, and they’ve held up well. I’ve been to my fair share of garage sales. That’s how I furnished my first apartment in college. Some sales I went to were obviously a last-minute thrown together event, while some garage sales were actually planned. Care was taken to make “shoppers” feel like they weren’t actually shopping at a garage sale for used stuff. The good ones had more of a nice thrift store or boutique feel. Now, I know it’s still a garage sale, but it doesn’t take too much effort to clean up your items so they aren’t covered in dirt and dust before putting them on folding tables or shelves. We also set big ticket or popular items near the curb at the end of the driveway to entice people to stop instead of just drive by. But for the most part, the majority of our annual garage sale items aren’t large items. We tend to have way more knick-knacks and small items than large items, and yet, we still yield $1,000 every year at the garage sale. We also sell more small items by grouping all the like items together instead of having things spread out and stuck in random places. Putting like items together also helps us with pricing. Every year we typically have an entire table of small knick-knack decorative items where we stick a large sign saying “Everything on this table – $1”. During my garage sale shopping days, I also realized that some garage sales are meant more for show than to actually sell things. What I mean is their prices are so high you might as well buy the thing new at an actual store instead of at their garage sale. On the flip side, some garage sales can actually be a turn off because their stuff is so cheap you have to wonder what is wrong with it. This is why, at my annual garage sale, I try to price things moderately. I know it’s used stuff and my ultimate goal is to get rid of it, but making a little money back along the way is an awesome perk. On the other hand, I want to make sure it sells because if it doesn’t, we donate everything that’s left over at the end of the sale rather than haul it back into my house to sit until the next annual garage sale. I think all of these things contribute to why we can make a combined total of $1,000 in one day at our annual garage sale. Even though it’s a nice way to earn a little money back from stuff that would otherwise be cluttering up my house, I’m still hoping that having an annual garage sale will cease to be an annual event at some point. As the years go by, I have noticed that less and less of the stuff in the sale is actually mine. This is because I’ve worked hard to make mindful purchases so I don’t keep buying things that will eventually be clutter in my house. Have you ever made bank at a garage sale? Or do yours have a low turn out? What lessons have you learned to have a more successful garage sale? We don’t have garage sales in my country, which is a pity, since there’s a lot of earning potential. Just looking around the house, we’d easily make at least 1-2K with all the stuff we have here that’s not been used in ages.